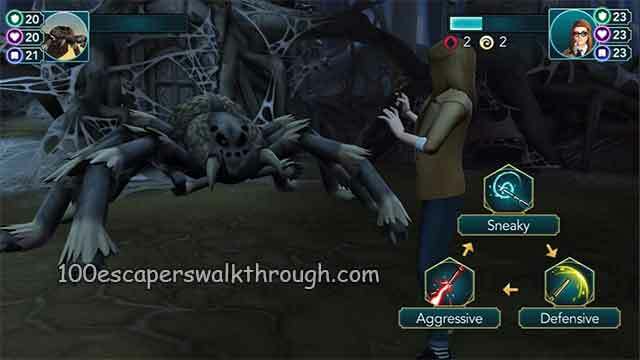 Walkthrough to Win Duel Acromantula Strategy Harry Potter Hogwarts Mystery and defeat the giant spider on Year 4 Chapter 16 ! 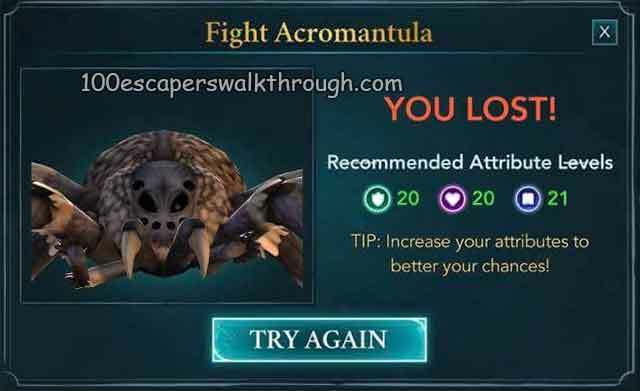 As we know before entering the forest Cursed Vault, we need to fight acromantula the spider who stunned you for 2 turns and got you bleeding for 8 turns. 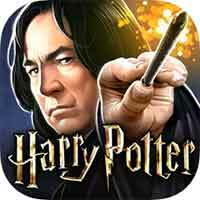 “Bleeding for 8 turns” from acromantula was so annoying, plus getting stunned for multiple turns in a row without fail. so the strategy is basically forget healing spell / potion and just attack. Only use aggressive or defensive and hope for the best. If you use sneaky and lose the turn, he can take off roughly half of your stamina. Increase your attributes to better your chances ! spamming depulso ! I noticed that he used Sneaky a lot, so Healing will do you no good when the Acromantula can stun and apply long-duration bleeding so easily. Best chance is finishing the duel as fast as you can with high damage moves. Once it used only sneaky, so I got him in 4 moves, for the second time he did D-A-S-S-A-S and I got it with the same strategy (spamming aggressive). The other tips is to spammed defensive / Bombarda, since guaranteed two turn stun if he hits you with his Defensive attack or 20 Damage Aggressive ones are more difficult to withstand than his Sneaky one. Obviously with enough luck you can win even against those, but I found spamming Defense more effective in the end.